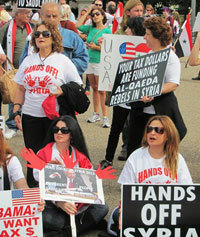 Speaking in the Rose Garden August 31, President Obama called on Congress to authorize the crime of attacking Syria. He and Secretary of State Kerry have pushed hard since then to secure authorization, despite widespread opposition by the people across the country and many in Congress so far unwilling to vote yes. 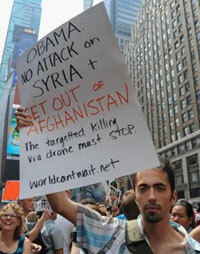 In his speech September 10, he is expected to reiterate the need for military action against Syria. In giving his justification for this August 31, Obama said U.S. intelligence shows the Syrian government used chemical weapons. Obama stated, “This attack is an assault on human dignity. It also presents a serious danger to our national security. 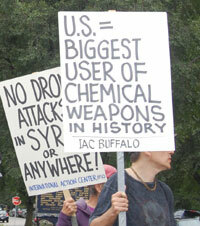 It risks making a mockery of the global prohibition on the use of chemical weapons. 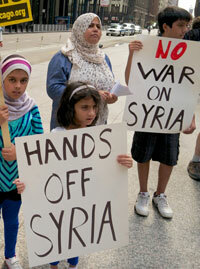 It endangers our friends and our partners along Syria’s borders, including Israel, Jordan, Turkey, Lebanon and Iraq. It could lead to escalating use of chemical weapons, or their proliferation to terrorist groups who would do our people harm. “In a world with many dangers, this menace must be confronted. Humanity, in its fight to end wars, has made aggression a crime. It is a crime whether it is done through missile attacks or troops on the ground. In calling on Congress to provide authorization for use of military force, Obama is again defying the laws and norms of international relations and the UN Charter. And he is demanding that Congress do the same, in a blatant affront to the Syrian and world’s peoples striving for an end to imperialist wars, foreign interference and for their rights to determine their own affairs. It is also a demand to obliterate the mechanisms established to deal with the use of chemical weapons without use of force and without interference in the affairs of other countries. The Chemical Weapons Convention (CWC), UN Charter and International Criminal Court all provide non-violent means to deal with use of chemical weapons and punish any party guilty of using them. The CWC, for example, provides for investigation of alleged violations by specialist bodies constituted by the Convention and recourse to the United Nations to authorize any use of force. The U.S. can submit its intelligence and “credible evidence” to the Convention bodies and the UN. As well, Obama’s claim that there is Security Council “paralysis” on this issue can also be dealt with. The matter can be taken before the UN General Assembly, under its Uniting for Peace procedure. Obama has no intention of utilizing this mechanism, as it would provide the General Assembly with the opportunity to denounce the criminal use of chemical weapons by the U.S., such as in Iraq, Palestine, Viet Nam and Korea. It would provide a forum for the General Assembly to denounce U.S. aggression and show the stand of the world’s people by overwhelmingly and justly voting down U.S. military action. Obama attempts to present himself as the defender of the very international law he has smashed. He said, “What's the purpose of the international system that we've built if a prohibition on the use of chemical weapons that has been agreed to by the governments of 98 percent of the world's people and approved overwhelmingly by the Congress of the United States is not enforced? No one, not Congress, or allies, or countries like Syria and Iran opposing U.S. aggression, can stand in the way. They are to “be confronted,” and U.S. enforcement of its dictate imposed. It is a presidential dictatorship, one posing increasing dangers on the peoples of the world. Continuing resistance in Syria, Iraq, Afghanistan, Palestine, worldwide and here at home all show, it is the peoples, taking their stand against U.S. aggression and for rights that can block these dangers. 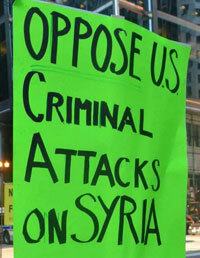 Let all join in opposing U.S. crimes and defending the rights of all abroad and at home! The hearings in Congress and recent passage by the Senate’s Foreign Relations Committee of their proposed authorization show a divided Congress. The vote in the Senate Committee on its proposed authorization was 10-7, with two Democrats voting no and one voting present. The proposal specifically bans use of troops on the ground while authorizing military action for 60 days with a thirty-day extension permitted. The full Senate was expected to vote the week of September 9 when Congress opened its session. However, that vote has been postponed as so far the votes have not yet been secured in Obama’s favor. While Senate leaders, Republican and Democrat, support the call for bombing Syria and claim the authorization will pass, that remains unclear. The majority of Americans are against any attack on Syria and are not dividing along partisan Republican and Democratic lines. 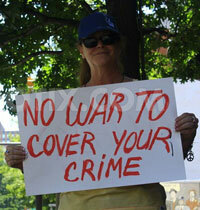 They are taking their stand against war and against more U.S. crimes. Many representatives in the House are facing the same situation. Representatives are reporting that 95 percent of those giving opinions are demanding a no vote. Democrats are saying they are being confronted with a difficult choice: Go against the wishes of the president, or defy voters back home who are overwhelmingly opposed to another U.S. military intervention. Representatives opposing bombing Syria include both veteran members, like Jim McGovern of Massachusetts, Jim McDermott of Washington and Earl Blumenauer of Oregon and newer representatives. And, as his speeches have indicated, he will decide whether and when to attack Syria regardless of the vote. The process is one where the president is demanding a yes vote, closed door sessions are used to convince politicians why they must vote yes, while all agree the overwhelming majority of the people oppose attacking Syria. But that majority does not decide. People across the country are rightly demanding that Congress vote No! While most do not think Congress represents their interests and needs renewal, they are insisting that Congress stand up to reflect the demand of the majority against any attack on Syria. The anti-war movement, representing that majority, is also rightly organizing to step up anti-war actions, having long experienced that government cannot be relied on to End U.S. Wars and Bring All U.S. Troops Home Now! 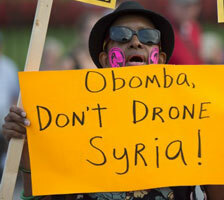 As Obama has indicated, he may well proceed without authorization. On the minds of many then is the necessity to strengthen the anti-war movement and its stand with the peoples of the world. 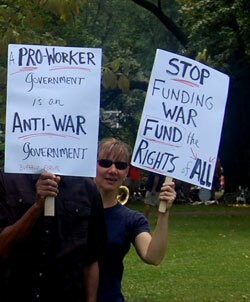 As one sign put it: Defend the Rights of All Abroad and At Home! No U.S. Wars! As Obama acts to strengthen executive rule, the people are organizing to empower themselves, fighting for an anti-war government. An anti-war government that brings All U.S. Troops Home Now! and organizes to defend the rights of abroad and at home. 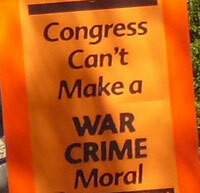 Demand that Congress vote no and Stop Funding War and Fund Our Rights! 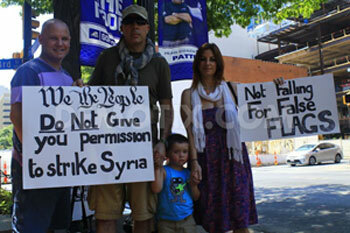 No to the Crime of Aggression Against Syria! On August 30, a spokesperson for Syria's Foreign and Expatriates Ministry stated that what the U.S. administration described as decisive evidence of the use of chemical weapon is spurious. After days of media exaggeration about the use of chemical weapons, on August 30, U.S. Secretary of State John Kerry only produced material based on old stories which were published by terrorists over a week before and are full of fabrications and lies, the Ministry spokesperson said. The spokesperson said that the Ministry is surprised that one of the biggest countries in the world is attempting to deceive its public in such a naive manner by relying on non-evidence. The Ministry denounced the U.S. practice of basing its positions on matters of war and peace on what is published on social networking sites, which the Ministry views as a desperate attempt to talk the world into accepting the planned U.S. aggression. 1. Syria has challenged the U.S. to produce one piece of true and logical evidence that it used the alleged chemical weapons. Kerry relied on fabricated images from the internet, while the alleged call made by a Syrian officer after the alleged attack is too ridiculous to be discussed. 2. 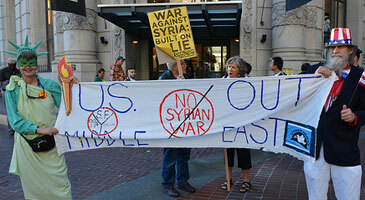 Syria never impeded or restricted the international investigation committee. On the contrary, the UN Secretary-General has lauded Syrian cooperation with the committee in his most recent call with the Foreign and Expatriates Minister on August 30, asserting that Syria permitted the committee to move exactly as per the agreement signed by the two sides. 3. The UN itself has said time and again that traces from the use of any form of toxic gas do not dissipate over time, and the proof of this is that the UN sent the investigation committee five months after the Syrian government requested an investigation of the March 19 Khan al-Assal incident. Therefore, the Syrian government did not delay the investigation committee's access to the alleged attack site, as this occurred within 48 hours of the arrival of UN envoy Angela Kane to Damascus. 4. The Syrian government affirms that Kerry's allegations that the Syrian Army knew about chemical weapons use three days prior to the incident are lies. This is proven by the fact that Syria requested the investigation committee to visit the Baharia area where Syrian Army soldiers were exposed to toxic gas, and the committee met the affected soldiers in the hospital. 5. If the aggression against Syria, as Kerry claims, intends to halt the use of chemical weapons, we would like to remind Kerry and the United States that Syria was the first to propose a draft resolution at the Security Council to make the Middle East free of all forms of weapons of mass destruction, and that the United States prevented the draft resolution from being passed. 6. Regarding Kerry's insinuations -- made to bypass the Security Council under the pretext that the investigation committee is not responsible for determining who used chemical weapons and that its task is only to verify that such weapons were used or not -- the Ministry affirms that the committee's tasks were set by the Security Council. The U.S. had pressured the committee to limit its authority, something which Kerry, being Secretary of State, certainly knows. On August 31, Syria's Permanent Representative to the UN, Bashar al-Ja'afari also clarified that the Syrian government had been briefed about information and cables concerning the use of chemical weapons in Syria. This verified information proves the involvement of Qatar, Saudi Arabia, Turkey and other governments, including the British government, in preparing chemical weapons programs through European companies financed by Saudi Arabia and Qatar, he said. He noted that the U.S., which is trying to pave the way for military intervention in Syria, is not a member of the Convention on the Non-Proliferation of Chemical Weapons and its stand on chemical weapons is hypocritical. He added: "Syria condemns the use of chemical weapons in Syria by anyone and requests to hold them accountable. Syria wants the UN investigation mission to continue investigations and make a scientific report to be presented to the Security Council for study." He urged that the mission be given enough time to produce objective and scientific results, free from political and military interference. In addition, Ja'afari sent a letter to Secretary-General Ban Ki-moon asking that chemical weapons experts in Damascus investigate attacks that occurred on August 22, 24 and 25 in three suburbs of the Syrian capital, following which dozens of soldiers had to be treated for inhalation of nerve gas. In terms of how to prevent a military conflict, a high-level Syrian government official stated that Syria endorses the Secretary-General's efforts to convene a conference at UN headquarters in Geneva, as it considers a political solution to be a way out of the current situation. 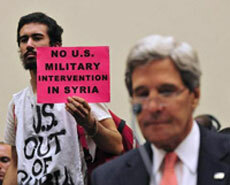 "Any aggression against Syria would wreck efforts for finding a political solution," he pointed out. The Obama administration’s public case for attacking Syria is riddled with inconsistencies and hinges mainly on circumstantial evidence, undermining U.S. efforts this week to build support at home and abroad for a punitive strike against Bashar Assad’s regime. The case Secretary of State John Kerry laid out last Friday contained claims that were disputed by the United Nations, inconsistent in some details with British and French intelligence reports or lacking sufficient transparency for international chemical weapons experts to accept at face value. After the false weapons claims preceding the U.S.-led invasion of Iraq, the threshold for evidence to support intervention is exceedingly high. And while there’s little dispute that a chemical agent was used in an Aug. 21 attack outside of Damascus – and probably on a smaller scale before that – there are calls from many quarters for independent, scientific evidence to support the U.S. narrative that the Assad regime used sarin gas in an operation that killed 1,429 people, including more than 400 children. The Obama administration dismissed the value of a U.N. inspection team’s work by saying that the investigators arrived too late for the findings to be credible and wouldn’t provide any information the United State didn’t already have. U.N. spokesman Farhan Haq countered that it was “rare” for such an investigation to begin within such a short time and said that “the passage of such few days does not affect the opportunities to collect valuable samples,” according to the U.N.’s website. For example, Haq added, sarin can be detected in biomedical samples for months after its use. The U.S. claims that sarin was used in the Aug. 21 attack, citing a positive test on first responders’ hair and blood – samples “that were provided to the United States,” Kerry said on television Sunday without elaboration on the collection methods. Experts say the evidence deteriorates over time, but that it is simply untrue that there would not be any value in an investigation five days after an alleged attack. As a New York Times report noted, two human rights groups dispatched a forensics team to northern Iraq in 1992 and found trace evidence of sarin as well as mustard gas – four years after a chemical attack. The U.S. assertion also was disputed in an intelligence summary the British government made public last week. "There is no immediate time limit over which environmental or physiological samples would have degraded beyond usefulness," according to the report, which was distributed to Parliament ahead of its vote not to permit Britain to participate in any strike. Anthony Cordesman, a former senior defense official who’s now with the Washington-based Center for Strategic and International Studies, took aim at the death toll discrepancies in an essay published Sunday. He criticized Kerry as being “sandbagged into using an absurdly over-precise number” of 1,429, and noted that the number did not agree with either the British assessment of “at least 350 fatalities” or other Syrian opposition sources, namely the Syrian Observatory for Human Rights, which has confirmed 502 dead, including about 100 children and "tens" of rebel fighters, and has demanded that Kerry provide the names of the victims included in the U.S. tally. An unclassified version of a French intelligence report on Syria that was released Monday hardly cleared things up; France confirmed only 281 fatalities, though it more broadly agreed with the United States that the regime had used chemical weapons in the Aug. 21 attack. Another eyebrow-raising administration claim was that U.S. intelligence had “collected streams of human, signals and geospatial intelligence” that showed the regime preparing for an attack three days before the event. The U.S. assessment says regime personnel were in an area known to be used to “mix chemical weapons, including sarin,” and that regime forces prepared for the August 21 attack by putting on gas masks. That claim raises two questions: Why did the U.S. not warn rebels about the impending attack and save hundreds of lives? And why did the administration keep mum about the suspicious activity when on at least one previous occasion U.S. officials have raised an international fuss when they observed similar actions? On December 3, 2012, after U.S. officials said they detected Syria mixing ingredients for chemical weapons, President Barack Obama repeated his warning to Assad that the use of such arms would be an unacceptable breach of the red line he had imposed that summer. Then-Secretary of State Hillary Clinton chimed in, and the United Nations withdrew all nonessential staff from Syria. Among chemical weapons experts and other analysts who have closely studied the Syrian battlefield, the main reservation about the U.S. claims is that there is no understanding of the methodology behind the intelligence gathering. They say that the evidence presented points to the use of some type of chemical agent, but say that there are still questions as to how the evidence was collected, the integrity of the chain of custody of such samples, and which laboratories were involved. Eliot Higgins, a British chronicler of the Syrian civil war who writes the Brown Moses blog, a widely cited repository of information on the weapons observed on the Syrian battlefield, wrote a detailed post Monday listing photographs and videos that would seem to support U.S. claims that the Assad regime has possession of munitions that could be used to deliver chemical weapons. But he would not make the leap. Holes in the case already have allowed Russia to dismiss the U.S. evidence as “inconclusive,” with Foreign Minister Sergey Lavrov saying in a speech Monday that Moscow was shown “some sketches, but there was nothing concrete, no geographical coordinates, or details…and no proof the test was done by professionals,” according to the state-backed RT news agency. There is also skepticism among U.S.-friendly nations, such as Jordan, which declined to endorse action until it studies the findings of a UN chemical weapons investigation, and Britain, where Parliament voted against intervention even before the U.S. released an intelligence assessment that contradicted one released a day before by British authorities. The U.S. and Israel confirmed that Israel fired two ballistic missiles in the Mediterranean Sea, in the direction of Syria, on September 3. The test was unannounced, intentionally making it unclear that it was a test. The norms of international law call for the Israeli Defense Ministry and Pentagon to issue a warning to the countries whose ships were cruising in the Mediterranean as well as countries in the area. This was not done, creating an even more dangerous situation in the region. Given the current tensions that exist, the test was a provocation, an attempt to provoke a military response from Syria, Iran or others. Such a response would be used to try and justify even more U.S. intervention in a situation where there is widespread opposition at home and abroad to U.S. war against Syria. It could also trigger a wider war, as various countries respond to what appears to be a missile launch against them. Only after the provocation failed did the Pentagon admit the missiles had been fired. The “test” also enabled the U.S. to spy on and gather information about how various countries, like China, Russia, Iran and Syria, responded to a possible missile launch against Syria. It was done at a time when the U.S. is preparing missile strikes and has battleships in the Mediterranean to carry them out. Ivashov continued, “From the angle of view of military strategy, the launch of ballistic missiles compels Syria and Iran to bring into full-scale action all the tracking systems they have,” including air defense systems that start reacting to missile launches. He explained, “When this happens, the U.S. warships, aircraft, and ground-based tracking systems immediately do the computerized identification of all the locations in Syria and Iran where combat operations control are exercised from — their working frequencies, the places where radar stations are deployed, their coordinates, technical characteristics, and so on.” This enables the U.S. to implement radio-electronic jamming of the combat control networks and to target them for bombings. A statement posted on the Russian Foreign Ministry website September 4 said Russia had submitted a 100-page report to the United Nations, laying out its evidence that Syrian rebels had used sarin gas in an attack against civilians in Aleppo in March. The report was submitted in July. Commonly such probes are not made public but given U.S. plans for military aggression against Syria, Russia made the existence of the report public. It includes detailed scientific analysis of samples that Russian technicians collected at the site of the alleged attack, Khan al-Asal in northern Syria. The attack killed 26 people and sickened 86. The report itself was not released. But the statement drew a pointed comparison between what it said was the scientific detail of the report and the far shorter intelligence summaries that the United States, Britain and France have released to justify their assertion that the Syrian government launched chemical weapons against Damascus suburbs on August 21. The longest of those summaries, by the French, ran nine pages. Each relies primarily on circumstantial evidence to make its case, and they disagree with one another on important details, including the number of people who died in the attack. The numbers range from about 300 to the U.S. claim of almost 1500. The Russian statement warned the United States and its allies not to conduct a military strike against Syria until the United Nations had completed a similarly detailed scientific study into the August 21 attack. It said that the current hysteria about a possible military strike by the West was similar to the false claims and poor intelligence that preceded the U.S. invasion of Iraq in 2003. Russia said its investigation of the March 19 incident was conducted under strict protocols established by the Organization for the Prohibition of Chemical (OPCW) Weapons, the international agency that governs adherence to treaties prohibiting the use of chemical weapons. It said samples that Russian technicians had collected had been sent to OPCW-certified laboratories in Russia. A UN team spent four days late last month investigating the August 21 incident. The samples it collected from the site and alleged victims of the attack are currently being examined at OPCW labs in Europe.